When you're first starting out as a cheerleader or your squad is still young, it is important to keep the routines simple. A very easy routine is perfect because everyone can do the motions, and the routine will be easily remembered in the middle of the excitement of a game. With new cheerleaders, focus more on technique than learning complicated cheerleading motions. Here are some simple routines to try with your squad. This video features two separate cheers. 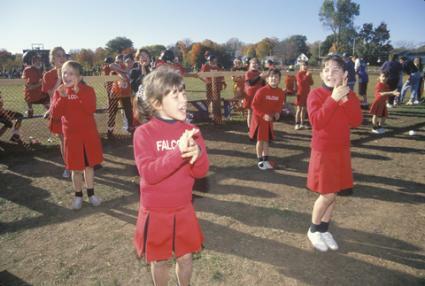 Each cheer is repeated several times with the cheerleader demonstrating while facing front, then back, then front again. Below you will find the same cheers but with different words, so you can still follow along with the timing in the video. You can use either version for your own routine or make up something completely different. The four lines are repeated, so this is an easy cheer for younger and beginner cheerleaders to remember. The motions are in parenthesis, but you an also view the video to see the exact way this routine is performed. This video shows a simple and popular cheer called Boom Dynamite that is fun and easy for even the youngest squads to learn. Or, try the following cheer that is similar in nature and just as easy to learn. If you're looking for more easy cheerleading routines to add to your repertoire, try one of these. These cheers will get you started, but when selecting simple cheers for your squad look for ones that use basic motions and are short and to the point. Some of the easiest routines for beginners to learn are those that repeat several times. Focusing on a few motions at first allows new cheerleaders to perfect the basics before moving on to more advanced skills.